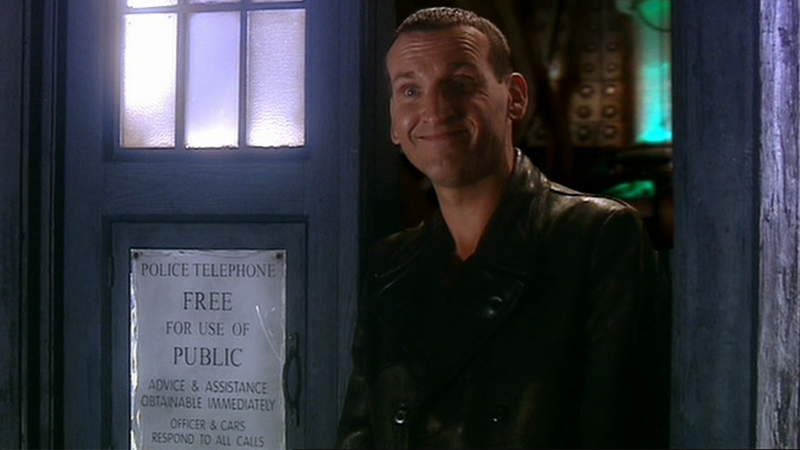 Christopher Eccleston at the end of “Rose”—a story in which he’s now not the only Doctor to show up in, thanks to a new novelization. No, Russell T. Davies isn’t a Time Lord, but he has written a new novelization of “Rose,” the episode that relaunched Doctor Who after decades away from television screens back in 2005. And in the process, he’s added and tweaked a few things—including some faces for the Doctor that neither Rose Tyler, nor even we, have met yet. The Radio Times spotted the addition in the new “Target” (the classic British publisher, not the store) style novelization of “Rose,” set to release in the UK tomorrow alongside adaptations of “The Christmas Invasion,” “The Day of the Doctor” and “Twice Upon a Time.” The sneaky moment comes when Rose, starting to research the mystery man she bumped into the night the shop she worked at went up in flames, meets with a Doctor-obsessed conspiracy theorist she met online named Clive. It’s small, but a clever choice to update the story. After all, timey-wimey is the Doctor’s whole thing—why wouldn’t there be a few sightings of the same mysterious faces showing up in across history that aren’t just the Doctors we already know of?